When recovering from a knee injury many Physio Therapists will encourage you to use an exercise bike as part of your recovery. That is because it is the most common piece of fitness equipment available in physiotherapy centres across the U.K as this machine can help to increase and restore the knee joints range of movement, improve the stability of the knee joint, strengthen the muscles around the knee, decrease or eliminate pain and prevent the re occurrence of an injury. How does a stationary exercise bike help with Physical therapy? Cycling is a low impact non weight bearing exercise that is suitable for all ages and for people of all fitness levels. Due to the movement of the leg when the knee is bent it can improve the range of movement in your knee joint. The cyclic movement will also nourish the joint cartilage. Working out on an exercise bike gives you a stable position and controlled movement so if your knee is feeling weak you do not have to worry about it giving way and you falling down. An exercise bike can also provide you a varied resistance so that as your knee improves you can challenge yourself further. Not only will you be improving your knees strength you will also be giving yourself a cardiovascular exercise. What exercise bike is best for rehabilitation? We recommend that you try not to use a recumbent bike as this can be quite low to the floor and can cause problems when you are trying to stand especially if your knee is still relatively weak and painful. An upright bike will allow you to place yourself on the seat without causing much discomfort. You will be able to adjust your seat height to suit you and ensure that you are not over stretching your legs whilst pedalling as this could cause more damage. A bike with adjustable handlebars is also recommended as again it will prevent any undue stretching and make you feel more comfortable. You will need a bike with variable resistance so that as your knee gets stronger and the pain subsides you can continue to strengthen the joints by pushing yourself harder. The JLL JF100 Stationary bike has 10 levels of magnetic resistance so it will continue to keep you challenged throughout your rehabilitation process. The maximum seat height for the bike is 84cm from the floor with a minimum height of 64cm, so you will not need to struggle to climb on to the bike. It has a padded foam seat so that riding is more comfortable. It also comes with an LCD monitor for you to track your time, speed, distance, calories and heart rate whilst you are exercising. The bike comes with adjustable handlebars that can be rotated to suit your position. 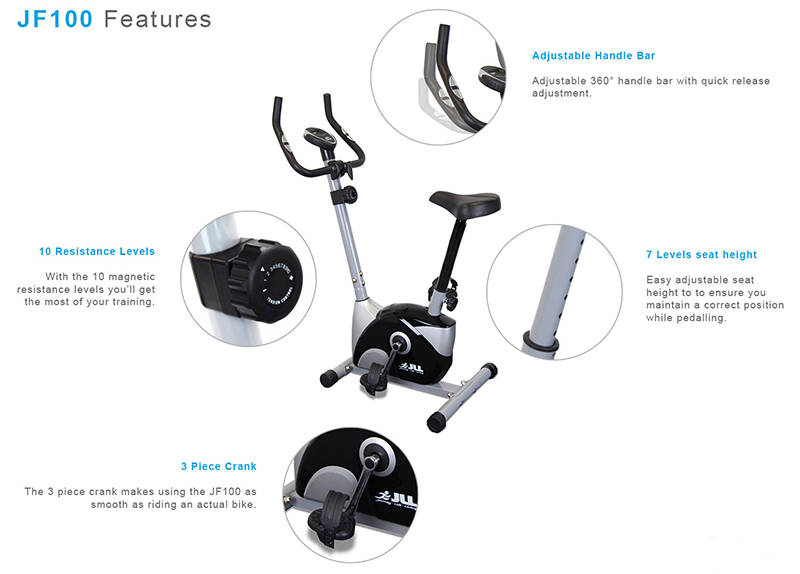 The JF100 exercise bike by JLL is ideal for those looking for something space saving and comfortable. This bike will suit your physical therapy needs. Previous story Why do you need a slow start up speed on a Home Treadmill?